← GRAPHICS TAKING US REALLY FAR! 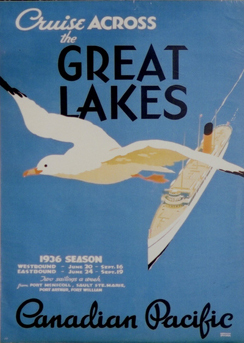 TWO GREAT CRUISES BY CANADIAN PACIFIC! 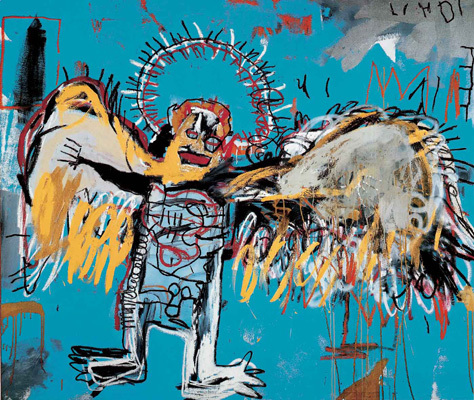 At the Art Gallery of Ontario these days, we come face-to-face with the puzzling phenomenon of Jean-Michel Basquiat (1960-1988). Starting out in the 1970s as a teen-aged New York City graffiti presence in the anything-goes Lower East Side, he graduated to graphic paintings which lifted him, meteorically, to remarkable heights of fame and fortune, only to crash and die at the age of 27. 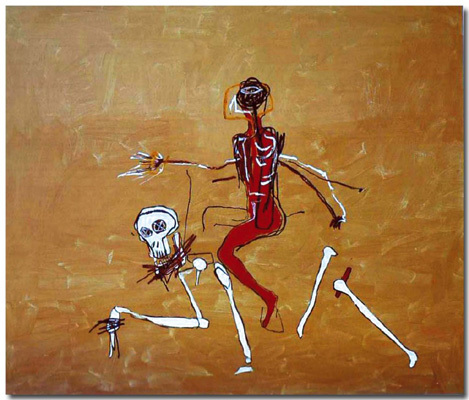 The painting shown above, rather presciently titled, “Fallen Angel,” could be approached in many ways–his Haitian roots, for instance, and the casual arrestingness of voodoo hysteria; Surrealism, for instance, and its invocation of life “more real” than common sense comportment; and, for instance again, the anguished compromise of blacks in world history. But although all of the above and others besides can be seen in the extended parade of an exceptionally inquisitive young man, I think there is about the initiative of this unlikely researcher a truly remarkable content which is well aware of the enormous difficulty of his very unusual metier. 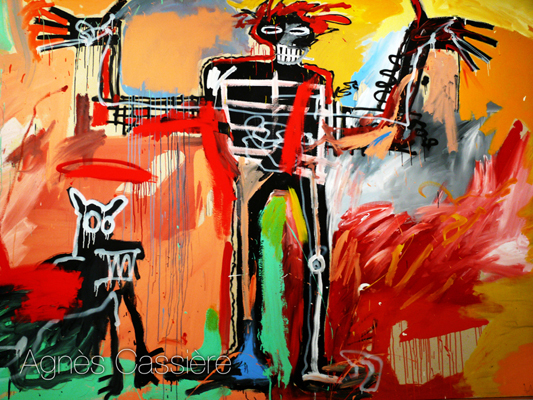 As you’ll see in the documentary film at the end of this blog, Basquiat was one of those alert and yet very cool young people–of which there are many more now, in 2015, than there were in his heyday of the 1980s–who are blessed with career smarts which hardly begin to get to the nub of their energies. I think that to fix on the narrative content of the works is–despite the artist’s espousal of many causes heavily subscribed to by the hipsters of New York and beyond–to take the tip for the whole iceberg. 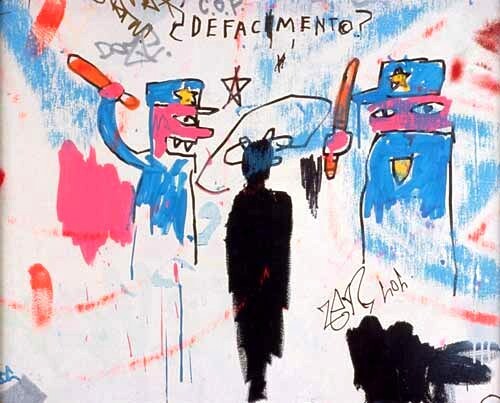 For instance, the painting above, “Defacement,” pertains to the death of Basquiat’s friend, Michael Stewart, who was beaten to death by police who showed no perspective in face of someone spray-painting on a subway station wall. Rather than do a re-run of the Civil War, however, that rather unremarkable humanitarian overture dovetails with a far more remarkable (and elusive) dealing with the bad and the good of active life. 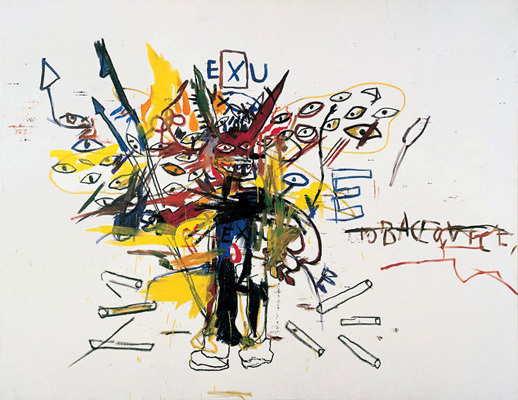 This dazzling display of handiwork–Basquiat being an instinctive and graceful master of vivid and authoritative drawing (which is very much about what not to show)–treats a perhaps fatal mishap as stemming from strangely joyous dynamics. This kind of paradox informs all his work and all his life. It is a spate of duality akin to a high-wire act, unforgiving of any loss of nerve and loss of confidence to produce a seemingly impossible fusion. The optics are germane to the misconception of his art as essentially political. Yes, it’s about a gulf and hostilities; but the gulf for him had to do, first and foremost, with the cool and the uncool. Not for him the socialist-humanitarian zealot’s obsession with the merely crushed. He was far more conversant with Madonna and Deborah Harry at Area the dance club, and their bedrooms. His warrior here (based on Afro-voodoo precedents) is proudly–actually, at this point, desperately–diligent in spearing feebleness of every stripe. The AGO show takes its title from the Charlie Parker jazz composition, “Now’s the Time,” and that musical work is the sound we hear on entry. So far, so good, Parker being a paragon of light-touch depth and devastation. 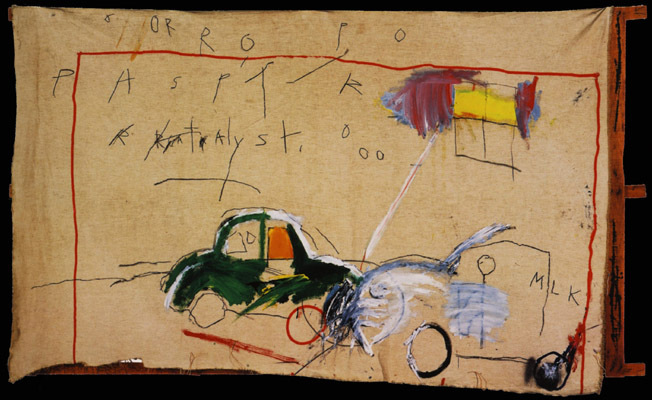 Basquiat loved Parker and anyone else who was “intelligent” (so of course he’d become an arts partner, briefly, to Andy Warhol). Further in, we hear a snippet of Martin Luther King’s speech, “I Have a Dream” which runs the phrase, “Now Is the Time” [to make real the promises of democracy] ad nauseam, like a North Korean interrogation centre. Also from that last year, “Queen with Paper,” its sense of being close to the close still, however, showing a firm purchase upon his project’s real business, namely, flickering overtures as to cogency in the course of a witty, masterful ride with dynamic, primally creative nature, rendered in texturing, color, composition and graphic modulation. (Sports figures like Hank Aaron and Sugar Ray Robinson are cherished for their noble body language, a rill Basquiat occupied and shared, when not backsliding, as his true homeland. A surreal family portrait exuberantly in love with cool moves! This entry was posted in Current Events, Surrealist Posters&Graphics and tagged Art Gallery of Ontario, Charlie Parker, Contemporary Art, Jean-Michel Basquiat, Martin Luther King, New York City, urbanity. Bookmark the permalink.